Electric car sharing stations, complete with charging docks should be up and running by Memorial Day weekend, transportation manager Michael Manzella said. The City Council voted this past week to approve three stations. Manzella also said he is in the preliminary stage of vetting whether or not to add scooters to the bike/car sharing program. 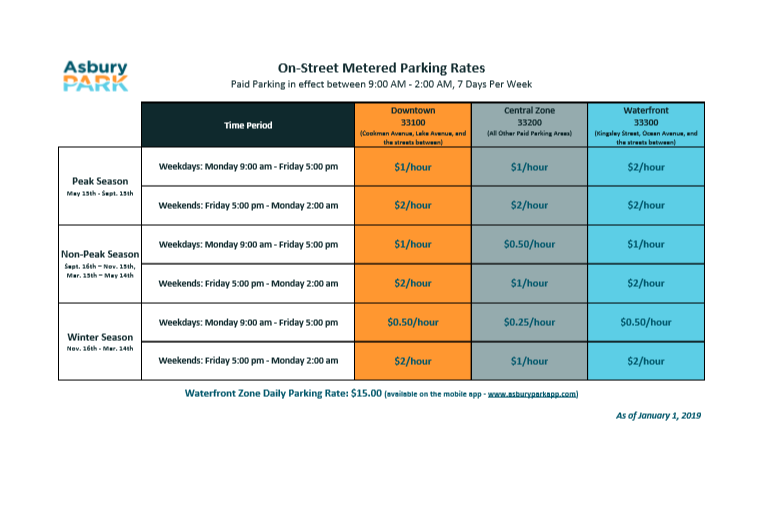 Moving on to parking meters – a switch to pay by plate sparked minor changes to parking rates but by and large the rates have not increased over last year, Manzella said. Instead, to accommodate the switch, neighboring zones like the Cookman and Lake avenue areas, were grouped together. Downtown 33100, which encompasses Cookman Avenue, Lake Avenue and the 100 Block streets in between. Central 33200, which encompasses all metered parking areas west of Kingsley Street and north of Cookman Avenue. And, the Waterfront 33300, which encompasses Ocean Avenue, Kingsley Street and the 100 Block streets in between. A daytime 2-hour parking limit is now in effect along Memorial Drive West, between Fifth and Sunset avenues [shown in featured photo]. 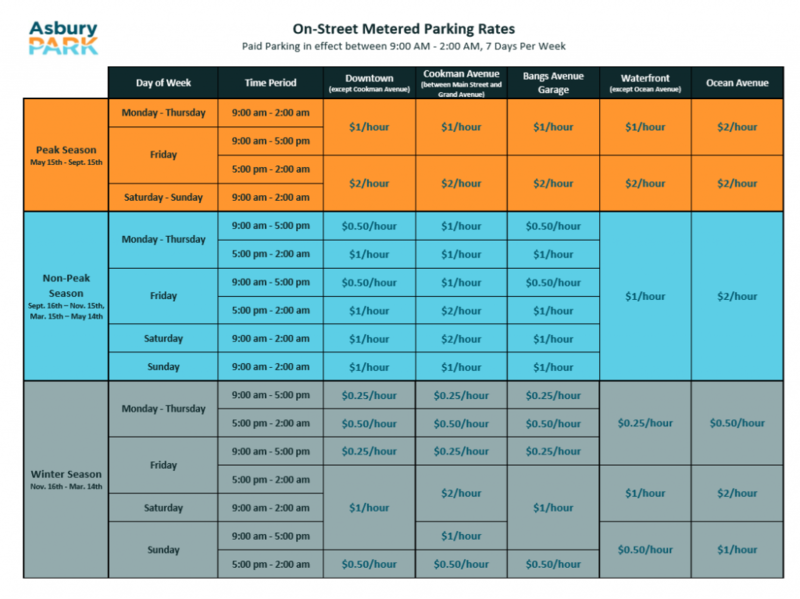 The 8 am to 6 pm 2-hour long parking restriction was put in place to accommodate parking turnover rates for the businesses located at the Shops At Sunset Point on Memorial Drive, Manzella said. The Main Street Road Diet project’s paving and striping moves to between Deal Lake Drive and Asbury Avenue Friday. Officials said no parking will be permitted along the Main Street’s south side between 8 pm Friday and 4 am Saturday. Continued project updates will be sent via municipal Nixle updates. To date, the emergency sanitary sewer repair between Sunset and Sixth avenues is now complete but the city still awaits NJDOT response for a request to replace the same lines along Main Street, north of Asbury Avenue. With regard to the City’s ongoing Road Rehabilitation Program, all projects launched in 2016 are now complete. Also completed is the rehab of vehicle bay door lintels at the Asbury Park Firehouse, intersection improvements at Springwood and Atkins avenues, replacement of the Springwood Avenue Sanitary Sewer line, Fourth Avenue Improvements, carbon media replacement at the wastewater treatment plant, and the Sunset Park footbridge replacement. Ongoing projects include the installation of curb and sidewalk following the completion of utility work associated with the Bridge and Heck street improvements. The City and iStar engineers are currently in talks with regard to the waterfront infrastructure project. Officials said, now that the final concept plan has been approved, they are working toward vetting design and construction cost estimates. And finally, the City is now accepting bids for Grand and Fifth avenue improvements, as well as for Deal Lake Drive. Transportation updates are also available monthly via the City’s website. For more on the pay by plate changes, visit asburyparkapp.com and myparkingreceipts.com.